After struggling to find an identity for themselves during a rough musical climate in the 1990's, TNT have finally found a sound that works for them in 2004. Firefly was an embarrassment as far as I'm concerned, and TNT briefly disbanded after the release of that album. The band reformed a couple years ago, and released Transistor. While that album was light years better than Firefly, it wasn't quite the comeback that most fans (including myself) were looking for. However, the band showed enough signs of life to indicate that the next album could be a very fine album. 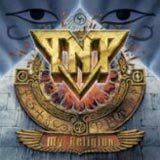 TNT has hit the nail on the head with this release, and many of the band's disenchanted fans should come back to the band with this new release, My Religion. My Religion sees the band embrace their past work as opposed to Transistor and especially Firefly which both saw the band trying too hard to reject their past. The guys have come up with a superb melodic rock album that seems to be the most logical step after the Realized Fantasies album. TNT haven't tried to release an album that seems stuck in a time warp some 15 years ago, yet they have managed to stay true to their roots in a most refreshing way. If you like what bands such as Talisman, Shakra, Westworld (Tony's other band), and PC69 are doing today, chances are you'll enjoy the new TNT as well. As I alluded to above, My Religion musically speaking sounds like a logical progression forward from the Realized Fantasies album. Ronnie Le Tekro's blazing solos are back. The opening track, Invisible Noise features a killer solo to get things started and you can expect to hear plenty more of these as the album progresses. Furthermore, the slick production really allows the more technical soloing to stand out even more. Ronnie also delivers his usual assortment of catchy riffs throughout the album that will seal their place in your memory alongside such classics as Everyone's A Star, Seven Seas, and Downhill Racer. Tony Harnell still has the range and the power that he has some 20 years ago. When the music calls for it, Tony is more the able to reach into the higher octaves without sounding thin or strained. The music of Westworld doesn't call for Tony to use the higher end of his range to often, but he proves that he is more than capable of adding his unique signature to his music with this release. The chorus lines feature thick harmony vocals that will sound very familiar to those of you who have followed the band since their early days. TNT never had a problem coming up with a catchy chorus lines, and My Religion is no exception. Again, the slick production also allows the harmony vocals to shine loud and clear as they are a major component of the band's sound. Each of the songs sounds different enough from each other such that the band can never be accused of repeating themselves. Furthermore, I can find no filler songs on this album, making this album a pleasure to listen to beginning to end. Simply put, this is a solid album of melodic hard rock from some veterans of the scene who know how to record great music. It evident that the band had a lot of fun making this album and that it is a sound that the band is comfortable with. This is a stark contrast to the past couple of albums, which certainly sounded forced and unnatural. All in all, I couldn't have expected or asked for a better album from TNT in 2004. It is still early in the year, but My Religion could easily win an award for "Comeback of the Year" in my book. TNT deliver a lesson in melodic hard rock and resurrect themselves from the abyss they had been engulfed in since the mid 1990's. If you gave up on these guys after the abysmal Firefly album, you need to give this album a chance. TNT is back!!! !